Digital transformation is inevitable and the use of digital tools have become a staple in how we conduct our daily, hyper-connected lives – especially in the office. In this era of digital transformation, the digital worker and the intelligent enterprise have moved from reacting to predicting the market, evolving trends and the consumer path. As our workplace evolves, the digital worker will continue to push the boundaries of work, fundamentally changing how work gets done by driving technological advancements. As a result, businesses must embrace new technologies, or they run the risk of becoming obsolete. By understanding what is on its way, welcoming change and being prepared to act, business can positively impact, people, reputation and profitability. This all starts with communication. Knowledge is acquired more easily than ever before, but it is how that knowledge is used and communicated that will make the difference. As the intelligent enterprise continues to shift in the adapting market, information – and how we transfer that information – becomes the critical denominator that propels businesses forward. 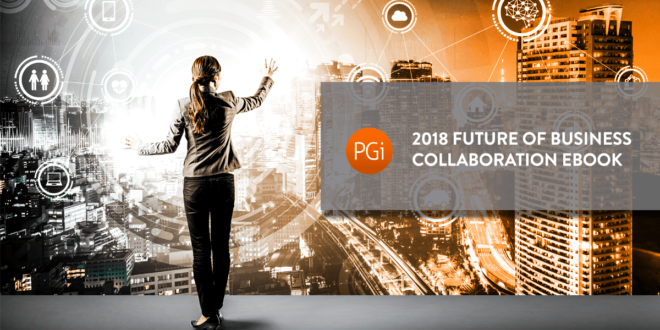 PGi’s 2018 Future of Business Collaboration explores how enterprise communication drives digital transformation and examines the business trends, tools and technologies in that will be critical to survival and growth in 2018 and beyond. This year’s edition of our annual eBook will transport you to a not-so-distant future, examining the emerging technology trends that will transform workplace collaboration. Is your business ready to embrace the change? To learn what trends are affecting how work will be conducted in the future enterprise of tomorrow, download our free eBook, 2018 Future of Business Collaboration, now. June McCarthy has served as PGi’s EVP, Marketing since 2017, responsible for all Marketing operations worldwide. June has over 20 years of experience in the technology industry, with 13 of those having been spent at PGi. Originally hailing from Ireland, June moved to the Atlanta area in 2016 where she’s active in local volunteer groups.